Our second main course in Rome is the Colosseum. The Colosseum may derive its name from a gigantic statue know as the Colossus that stood nearby. The statue represented Nero. 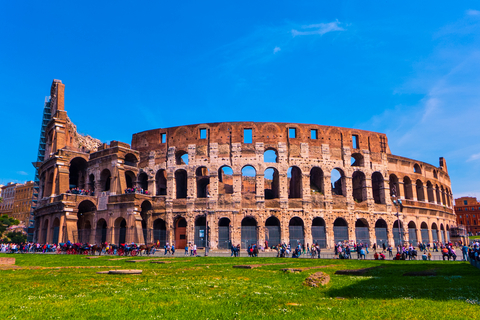 The massive structure of the Colosseum was an engineering marvel for its day. 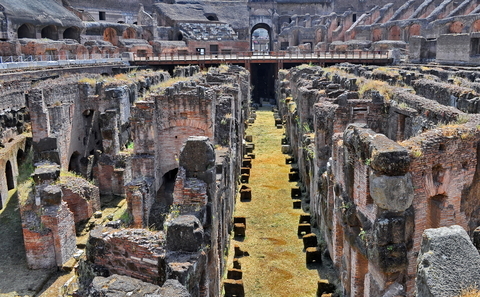 Known as an amphitheater, which literally means two theaters combined, it included four stories above ground and the necessary subfloors to house the wild beasts, gladiators, and other props necessary for entertaining the crowd. It is the largest amphitheater ever constructed. Started in AD 72 by Vespasian, the completion materialized in AD 80 at the hands of Vespasian’s son, Titus. One hundred days of celebration authorized by Titus commemorated the monumental achievement. The Colosseum, quite near the governmental center of the Forum, held 50,000 spectators with standing room for up to 80,000. The structure stands 157 feet tall, is 615 feet in length and 510 feet wide. It covered about 6 acres at its base. As a comparison, the Dallas Cowboys AT&T stadium, one of the largest domed stadiums in the world, covers 73 acres of land, is 292 feet tall, 900 feet long (from one open end zones to the other, and is at least as wide as the Colosseum. The domed structure houses 80,000 spectators in permanent seats that can be expanded up to 111,000. In the Colosseum, gladiator contests, hunting displays, wild animal face-offs, mock Naval engagements, and other spectacular events drew huge crowds. The ingenious system of eighty gates allowed quick access and egress for each level of society. Though many articles state Christians lost their lives in great numbers at the Colosseum, our Rome tour guide, Maritzio, disputed that information. He said, “Christians were not martyred in the Colosseum, as you might think. Those who lost lives here were slaves. The Romans at that time martyred most Christians in the Circus Maximus, a nearby chariot-racing venue. The Colosseum is a fascinating building to explore. Tourists can still examine the Doric, Ionic, and Corinthian half-columns in the first, second and third levels. Inside, the remains of the underground rooms show the significant preparations event organizers must have made for each show away from the spectator’s sight. This amazing monument to Roman engineering prowess is worth time on your visit to Italy. And surrounding architecture contains other remnants of that day such as the Arch of Constantine, the Meta Sudans (a brick fountain), Titus’ Baths, Trajan’s Baths, the Temple of the divine Claudius, and more ruins to explore on the Seven Hills of Rome.